UPDATE, AUG. 6 — Also, try taking the boat to Seal Beach from Long Beach! 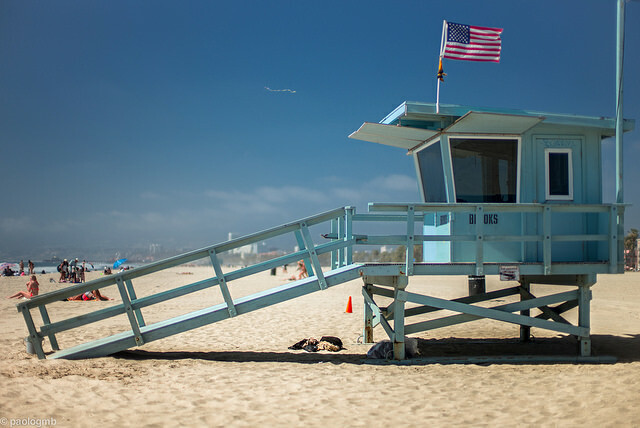 Looks like L.A. is bracing for a long, hot, sweltering summer…which means more opportunities for you to enjoy a refreshing swim at the pool or a dip in the sea! Check out this previous post for a list of transit accessible public pools. And keep reading for directions on how to Go Metro to the shore. The iconic, world-famous Santa Monica Pier (and the ocean) is a three-minute walk from the Expo Line’s Downtown Santa Monica Station. You can also take the Beach Bus to Santa Monica — the Topanga Beach Bus operates all year round between Warner Center, where you can catch the shuttle to the Orange Line, and downtown Santa Monica. Fare for the Beach Bus is $1. Bonus: for $1.75 you can grab a Metro Bike and ride the beach bike path over to Venice Beach. If you’d prefer to head straight to Venice, Metro Rapid 733 is an option, as is Metro Bus 108 (which also swings by Marina del Rey). Another thought: there are also plenty of bike rental places in Santa Monica, where you can grab a bike for a day and explore the 22-mile Marvin Braude Bike Trail that runs mostly along the beach from the Pacific Palisades to Torrance. It’s a good way to find less crowded beaches and explore some of the cities along the coast. Metro Bus 534 travels between Santa Monica and Malibu along the Pacific Coast Highway and offers a pretty darn scenic bus ride. This bus drops off at Will Rogers State Beach and Topanga Beach. Take the Blue Line to Downtown Long Beach Station and then it’s about a five-minute walk to the marina. Or hop on a free Long Beach Transit Passport bus. If you’re determined to find sand right away, use 1st Street Station. From there, walk south on Long Beach Boulevard, then east on on Ocean Avenue. You’ll come across the sandy volleyball courts in about 15 minutes. If you don’t mind a little boat ride, hop on the Long Beach Transit AquaTaxi to Alamitos Bay Landing. That drops you off less than a mile from Seal Beach Pier. Fare for the AquaTaxi is $5. Dockweiler State Beach is a long stretch of beach that’s a little bit quieter than the more touristy beaches. Take Metro Bus 115 to Playa Del Rey, which is part of Dockweiler State Beach. Bus 115 connects with the Blue Line at Firestone Station and the Green Line at Norwalk Station. Metro Bus 130 travels around Hermosa Beach and Redondo Beach and connects with the Silver Line at Harbor Gateway Transit Center. And Metro Bus 232 connects the Blue Line Downtown Long Beach Station with Manhattan Beach and El Segundo. For those days when you just can’t make it out to a beach or pool — a splash pad is a good alternative, and Grand Park has a great one. Take the Red or Purple Line to Civic Center/Grand Park Station. Multiple Metro and DASH buses also stop in the area. Plus if you go after dark, you can enjoy a splashy light show. Of course, if it’s seriously hot outside it’s best to stay indoors if possible. For tips on how to avoid heat-related illnesses, or to find a cooling center, call 211 or check lacounty.gov/heat. In Santa Monica and Venice, there are also a whole bunch of Big Blue Bus lines, as well as Metro lines 720, 704, and 733, that’ll get you close to the beach. It looks like line 108/358 and Culver City Bus 1 also end right by the Venice Pier. Dockweiler is not quiet. Jets pass overhead all the time.